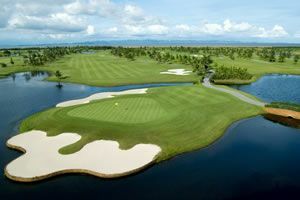 The Hua Hin and Cha Am golf area is located on the western side of the Gulf of Thailand, and is approximately a two and one half hour drive from Bangkok. 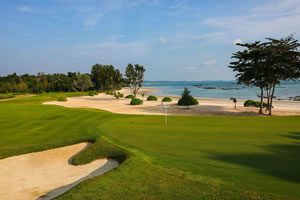 Thailand’s original beach resort, it now sports a selection of Hua Hin and Cha Am golf courses, available for play during your Thailand golf vacation. While the beaches of southern Thailand, Phuket and Samui, were discovered only recently and have since undergone rapid and sometimes destructive development, Hua Hin was developed in the early 1920’s by King Rama VII as an ideal getaway from Bangkok. The tranquil fishing village was turned into the resort for the Royal Family and thereafter became popular among the Siam nobility and upper-class. For over 75 years now, the Hua Hin beach resort has been a popular holiday area for affluent Thais, and although it still retains the intimacy of a village, it has successfully incorporated modern luxuries without the commercialism of other resorts, and the area has kept much of its old world charm, and colorful ways. Today Cha Am, Hua Hin’s northern neighbor, is still a thriving fishing village with its own local fleet. On most evenings, holidaymakers can stroll down and explore Hua Hin town’s winding roads with a great variety of shops and boutiques. There are many restaurants built over the harbor on stilts in the sea that offer superb fresh Thai seafood, all caught locally. The oldest and most traditional Thailand beach resort combines the attractions of a modern holiday destination with the charm and fascination of a still active fishing port. And while most other Thai holiday destinations cater mainly to foreign tourists, Hua Hin is a holiday resort for foreigners and Thais. The town of Hua Hin itself is clean and friendly, with neither hardly a go-go bar nor any loud discotheques like found in some of the other popular Thailand tourist destinations (e.g. Pattaya). This makes Hua Hin most suitable for couples and families seeking a high quality and safe beach resort for a golf vacation base. Hua Hin boasts many internationally known hotels, such as the Sofitel Hua Hin, Hilton Hotel, Hyatt Hotel and Marriot Resort to name but a few, as well as some world class boutique properties such as Chiva Som Spa, Wora Bura Resort, Anantara Resort, and Case De Mare Hotel. It takes approximately 2 hrs to reach Hua Hin from Bangkok, thus making a 2 centered golf vacation one of the most popular options for those seeking a golf holiday that combines the best shopping and golf in Thailand with a top beach resort. Please inquire as to these options as we would be honored to propose a custom golf package for you. Besides golf, Hua Hin is also an ideal base for excursions. A wide selection of national parks mountains, caves, waterfalls, ancient palaces and temples are all within 1 hours drive. All major Thailand towns have their own unique Night Market, and Hua Hin is no exception. There are local crafts, marble carvings, silver and silks of the region for sale, all available at bargain prices, and this is a great way to relax in the evenings after golfing in Hua Hin. For a quieter, relaxing holiday, Hua Hin is the ideal beach destination for a Thailand golf vacation holiday. Besides the unspoiled 5 mile long beach, Hua Hin provides the highest density of world class golf courses anywhere in Thailand. While Hua Hin is yet virtually undiscovered as an international golf destination, there are many first class resorts in every price category to choose from without all hassles, tourist traps, and proliferation of bars, girls, and discotheques found in other Thailand beach resorts. Golf holidays in Hua Hin are everything you could expect from such an exotic location and more, peaceful relaxing yet bright charming and full of mystery, golf Hua Hin truly is an unforgettable experience. For a quieter, relaxing golf holiday, Hua Hin is the ideal destination to spend your Thailand golf vacation.